Open Studios Napa Valley takes place Saturday and Sunday, Sept. 22–23 and 29–30, at various venues. 10am to 5pm each day. Free. Info and maps at artnv.org. COLORS OF THE VALLEY Lis MacDonald’s abstract alcohol ink painting ‘Dreamscape’ adorns the cover to Open Studio Napa Valley’s 2018 catalogue. Several dozen of Napa Valley's most creative minds open their doors to the public for the 31st annual Open Studios Napa Valley self-guided art tours Sept. 22–23 and Sept. 29–30. The popular event is the highlight of the Art Association Napa Valley, a nonprofit organization that provides funding, marketing and exhibiting opportunities to over a hundred member artists in the county. Along with the association's co-operative Art Gallery Napa Valley, the annual open studio tour is art lovers' best chance to see works from local masters, buy art directly from the source and peer into the minds of each the 64 exhibiting artists. "Napa Valley seems to be a very picturesque surrounding for many artists to live in," says Open Studios Napa Valley 2018 chairperson Lis MacDonald. "But not every artist does grape leaves and wine bottles. We have all sorts of different artists. We have furniture makers, we have potters, ceramicists, painters, people who make silk scarves." 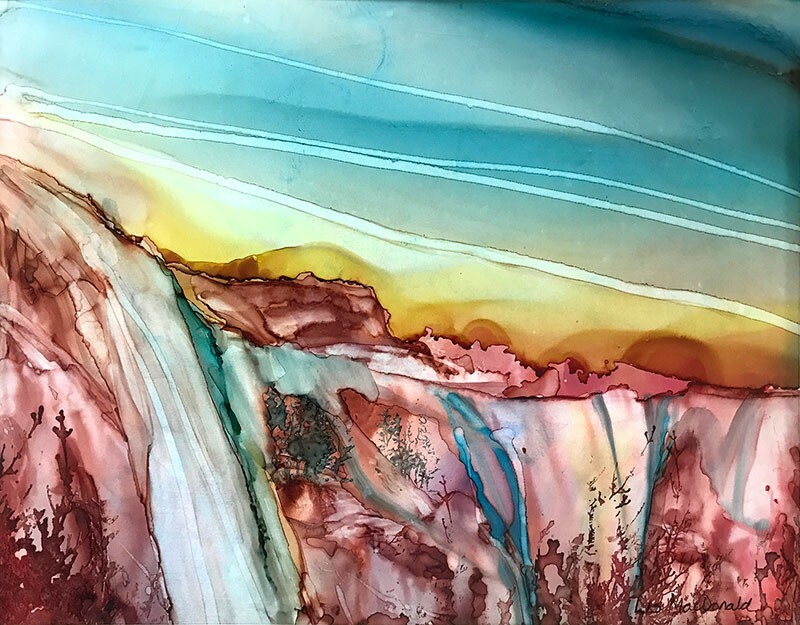 MacDonald knows each participant in the open studios tour by name, and is an artist herself, specializing in watercolor and recently working with colorful alcohol inks, which she tilts onto synthetic Yupo paper to create vivid abstract pieces. With 14 new artists contributing to this year's tour, MacDonald is especially excited for people to see what Napa Valley has to offer. She also points out that the Tubbs and Atlas fires of last October affected several returning artists, who will be showing new works created in the aftermath of that experience. "We had a number of artists that lost everything," says MacDonald. "But they've made new work and are still participating." Those artists include Calistoga-based landscape painter Karen Lynn Ingalls, who lost her barn studio in the Tubbs fire, and award-winning artists Edmund Ian Grant and Kristi Rene, whose home on Soda Canyon Road in Napa served as studio and gallery space until the couple fled from the Atlas fire. "They barely escaped with their lives," MacDonald says. Visitors can see these artists in locations like the Calistoga Art Center, which will have five artists exhibiting, and Markham Vineyards in St. Helena, hosting four artists this year. Maps and other information can be found in the Open Studios Napa Valley catalogue, available in print throughout the region and online. Next month, Jessel Gallery continues to support Napa Valley art with a one-year wildfire anniversary show, "From the HeART," dedicated to and featuring local artists affected by the October 2017 wildfires.